Malcolm Arnold was born into a musical family and learned piano and violin as a boy. He left his Northampton home at the age of 16 on a scholarship to study composition at London's Royal College of Music, before joining the London Philharmonic Orchestra as a trumpet player at 19 and later becoming their Principal Trumpet. William Lloyd Webber (father of Andrew and cellist Julian) was one of his composition teachers at the RCM. During the war years he managed to find time for composition between performing and two years of military service, and the LPO performed and subsequently recorded some of his early works. He gave up playing to concentrate on composition, but his orchestral experience was invaluable to his knowledge of the orchestra. He went on to compose 9 symphonies, 30 concertos (including a Guitar Conceto for Julian Bream, a Clarinet Concerto for Benny Goodman, a Harmonica Concerto for Larry Adler and a Cello Concerto for Julian Lloyd Webber continuing the family connection), various other band and concert works (including 2 sets of "English Dances", Scottish and Cornish Dances, and other works inspired by the British countryside), ballets, operas, vocal and chamber music. As if this wasn't prolific enough he also composed the music for many films and some televions programmes. In film music he is remembered particularly for "Bridge on the River Kwai" which won him an Academy Award but his contribution to the British film industry extends far beyond this. Arnold's film music style is very distinctive and easily recognisable to those acquainted with it. It typically involves the whole orchestra seemingly working as a single instrument, and instantly pulls you into the story as it unfolds. The music just flows like a stream of consciousness from one mood to another without being in any way disjointed. It is polyphonic in the late romantic manner, yet clear and direct with a balance between melody and texture. Those melodies could be simple recurring figures or extended lyrical sections. His music is full of drama and emotion, though aware of subtleties. His music could be described as generally optimistic, yet with a darker undercurrent. Nevertheless, humour was a consistent part of his repertoire and he brought out this aspect of characters and situations in an engaging way with empathy and humanity. He was interested in all sorts of music, from Classical and Jazz to Folk and Popular Song, and his output drew on all those sources. His concert works are clearly from the same varied stable yet his symphonies in particular are often much darker in nature, perhaps reflecting some of the tumultuous events from his personal life. (Both his marriages failed and he suffered from periods of alcoholism, depression and suicidal despair.) Arnold's symphonies seem to have a synergy with those of Mahler and Shostakovich and he wrote some ballets, the first called "Homage to the Queen" to mark the coronation of Queen Elizabeth II in 1953. Arnold's work for the screen included a number of documentary films and, as might be expected, there were quite a number of films with a military theme in the decade following World War Two. With this necessary patriotism and his country's musical figures of Elgar and Walton, his music sounds quite British though decidedly more eccentric than those other composers. Like Maurice Jarre he also formed a fruitful relationship with director David Lean, which resulted in "Hobson's Choice", "The Sound Barrier" and the previously-mentioned "Bridge on the River Kwai". 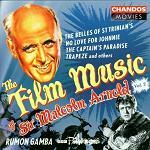 The lighter side of Arnold's music is in evidence with the "St. Trinians" series of films, with several recurring tunes full of wit and humour. The main theme hints at school assembly with its piano played by four hands, and there is another deliciously shady theme for the spiv character played by George Cole. These themes were used in all 4 St. Trinians films scored by Arnold in the 1950s and 60s, and were included by James Kenelm Clarke in "Wildcats of St Trinians" in 1980. With a wealth to choose from it is difficult to single out particular films, but "Inn of the Sixth Happiness" and "Whistle Down the Wind" spring to mind as engrossing cinematic story-telling in which music seems to be an integral part. "Inn of the Sixth Happiness" has a memorable theme tune which becomes synonymous with the caring determination of Ingrid Bergmann's missionary character, and the children are taught to sing This Old Man. The music carries the concerned hope of the movie as those same traits are displayed on the gruelling journey over the mountains (Snowdonia in Wales substituting for the hills of China). Malcolm Arnold also had a part to play in the music for "The Battle of Britain". While Ron Goodwin was brought in to do most of the music, William Walton's music was retained for the compelling aerial compat scenes. Walton called on Arnold to assist with the orchestration and to conduct his music. 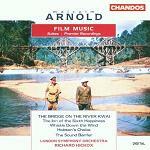 In "Bridge on the River Kwai" (based on the Pierre Boulle novel "Bridge over the River Kwai"), Malcolm Arnold created an arrangement of the well-known "Colonel Bogey March", with the addition of a counter-melody which is heard frequently in the film. The original "Colonel Bogey March" was written in 1914 by the British army bandmaster Frederick Joseph Ricketts (1881-1945) under the name Kenneth J. Alford. Carl Davis, when conducting the RSNO for its "20 Oscar Winners" concert in 2003, introduced this work saying that when naughty words were sung to "Colonel Bogey" during WWII, the original composer was horrified and banned public performances of this tune. The ban doesn't apply to Arnold's music so Davis proceeded to conduct only the Malcolm Arnold arrangement without the main tune - familiarity immediately makes the audience recall the missing Colonel Bogey whistling theme. For more than two decades, Arnold was looked after by a friend called Anthony Day who supported the composer and his ongoing work. A Malcolm Arnold festival took place in his birth town of Northampton, timed to coincide with the composer's 85th birthday on 21st October 2006. Sadly Arnold died on 23rd September 2006, but the festival seems to be a recurring event and more information can be found at the festival website. We recommend "Whistle Down the Wind" but this soundtrack is hard to find. "Inn of the Sixth Happiness" is currently unavailable on CD but available for download. Here are links to Arnold's film music below. He also has a wealth of concert orchestral and chamber music recorded, and we would suggest the composer's symphonies as an excellent place to start. The Malcolm Arnold Society promotes the composer's music and more information can be found at their website.